These are my and my adults daughter’s firm favourite now. They freeze well, too. I use only half of the choc bits. I’m glad that you both like them! And great to know that they freeze well. :) Thanks for your comment! I substituted ground flax for the coconut flour (I don’t like the flavor of coconut flour) and the muffins came out super moist and delicious! Do you have any idea what the calorie count is on these? There’s unfortunately no sub for coconut flour so you really need it for this recipe. :( Sorry about that! This was amazing.. since going paleo I needed some form of chocolate fix. I made per the recipe but reduced honey to 1/4 cup and reduced choc chips by half. Still turned out sweet and chocolatey as ever! 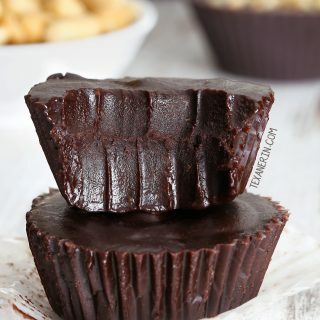 These would also be great with an almond butter cup in the center! It’s great to know that it works well with less honey! And I love your almond butter cup idea. :) I’ll have to try that. Thanks for your feedback! Muffins turned out delicious. This will be a keeper for us, thank you! My daughter and I had them for breakfast , they are so good. I forgot the honey and I only add half cup of dark chocolate chips, they are still rich in chocolate and sweet. Wow! I’m surprised they came out well without the honey. That’s great! Thanks for your feedback and I’m very sorry for just now seeing it. I’m very sorry for just now seeing your comment! I’m also super happy to hear that you like the other recipes, too. :) Thanks for your feedback and sorry again for only now replying! These are good. I made mine into mini muffins and got about 32. I found I actually had to cook them a bit longer than usual for a mini muffin but I kept testing them until the toothpick came out clean. It took about 18 min. Otherwise I followed the recipe. I think next time I’d like to try using sugar-free maple syrup for the honey to reduce the carbs a bit. I’m so sorry for just now seeing your comment! I’m glad that they worked out well for you. :) How strange that you needed more time for mini muffins! Usually I do those for 7-8 minutes. Thanks for your comment! Thanks for the recipe! I panicked when three people in my picky-eater family were diagnosed with celiac, but these muffins have saved me. Everyone loves them, so I make them 4 batches at a time and freeze them for people to pull out whenever they need a snack. They are tasty, and very forgiving to the distracted baker, which is a lifesaver for me. I have shared them with so many friends and family, and everyone comes back asking for the recipe, gluten free and gluten lovers alike. I think we would have all panicked! That must have been difficult. I’m so happy to hear that the muffins helped a bit. :) I love that you make 4 batches at a time. I’m jealous of your capability of not having the freezer packed full at all times. ;) Thanks for your comment and for sharing the recipe with your friends and family! They are healthy and taste delicious! Yay! Happy to hear that. :) Thanks for your comment! It was surprisingly delicious! Very moist; reminds me of a brownie like texture and taste. My 3 yr loved it! Definitely be making it again! I’m glad to hear that they were a hit with your kid! That’s always a good thing. :) Thanks for your comment! Haha. I’ve done that sooo many times. Usually for me it’s the baking soda or the “main” ingredient – like chocolate chips in chocolate chip cookies, blueberries in blueberry muffins. I’m happy that you enjoyed them! Good call on taking them out early. :D Thanks for your comment! Refined coconut oil? Processed Dutch cocoa? This is terrible for you! Why not virgin coconut oil and cocoa powder? Would butter work in place of the coconut oil or any other oils? I think butter would be fine as well as olive oil! This recipe looks great. 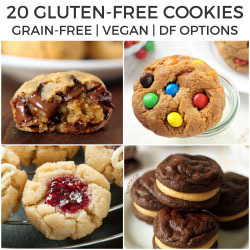 Can I substitute GF AP Flour or Oat Flour for the Almond Flour? I cannot eat almonds. Thanks! Unfortunately not. Almond flour is really only interchangeable with other nut flours / meals. Can you have hazelnut or cashew meal? I left out the honey so it could be sugar-free. Used walnuts instead of chocolate chips. Didn’t have any coconut flour so used all almond flour. Absolutely delicious! So you just used an additional 3 tablespoons of flour? Good to know that that works out well! I’m so happy that you enjoyed them. :) I bet they’re great with walnuts! Thanks a bunch for your comment. I am not a baker . And prefer gluten free . I have made MANY disaster gluten free baked goods . These are amazing ! Perfect combo of flours , sweetness . And the big test – my kids love them ! Satisfies my chocolate craving . Are you able to give the nutritional info ? Sugars , carbs , fat . I’m so happy that you and your kids enjoyed the muffins! I don’t have that info but you could use this recipe analyzer if you’d like for the nutritional profile. :) Thanks a bunch for your comment! This is AMAZING! 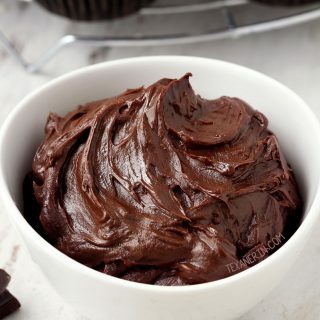 i am gluten free, dairy free and soy free so to find a recipe that is moist and fudge like is such a blessing! Thank you for sharing this recipe, my partner absolutely loves it and didnt even realise it was missing the Gluten and Dairy. I cant wait to try your other dessert recipes! Aww, yay! I’m always especially happy to hear that people who can eat everything also like these allergy-friendly recipes. 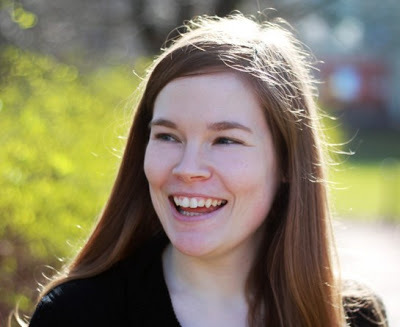 :) Thanks a bunch for your comment and I hope you’ll enjoy the other recipes just as much! These are so good!! Definitely takes care of my chocolate cravings. My whole family loves them:). I’ve used pure maple syrup when I’m out of honey. I also only use 1/2 cup chocolate chips. They come out perfect every time! Thank you! You’re welcome! I’m so happy that you’ve been enjoying them and to hear that maple works well, too. :) Thanks a bunch for your comment! 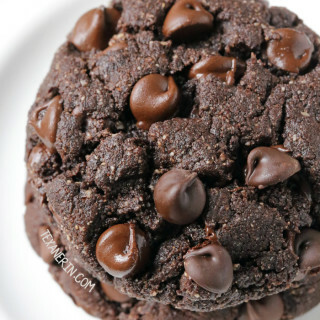 Ok… I never leave comments when I make variations to a recipe, but it’s sooooo yummy I just have to in case others want to try lower sugar, and an alternative to coconut oil or butter. 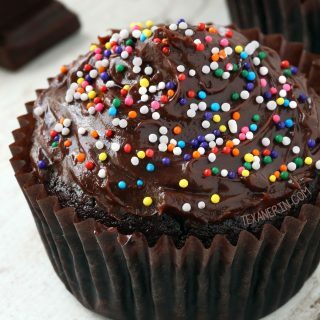 This recipe is very similar to the Healthier Carrot Cupcake recipe and both are unbelievable (I’ll post a comment there too)!!! I’ve been looking for gluten-free options for sweets that only have nut flour for a long time now, and I’ve hit the jackpot!!! THANK YOU!!!! So I subbed honey for 3 tbsp maple syrup (only because I prefer the taste of maple syrup), subbed coconut oil for 2 tbsp coconut yogourt (works with dairy yogourt too, cupcakes end up especially velvety if you use Greek yogurt, even more so if you use Icelandic Skyr yogurt) and I omitted the chocolate chips entirely. When substituting oil or butter, I tried apple sauce first, and it wasn’t as good as the recipe where I tried yogurt. I had to bake my muffins for 25 min to cook fully in the middle. My family is not crazy about bananas,so I substituted 286 grams of organic carrot puree-absolutely delicious! Have made it several times. Definitely a keeper. Oh, wow. Sounds great! 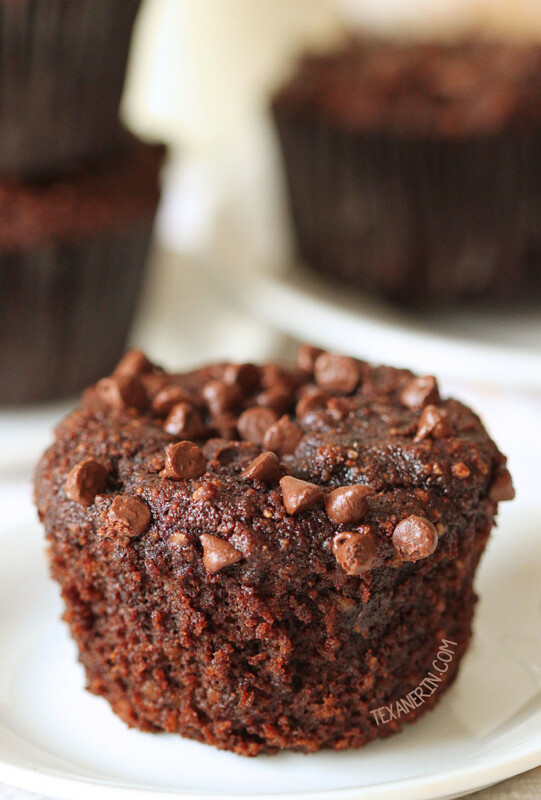 Can you taste it at all or does it taste like a regular chocolate muffin? Thanks for the tip! 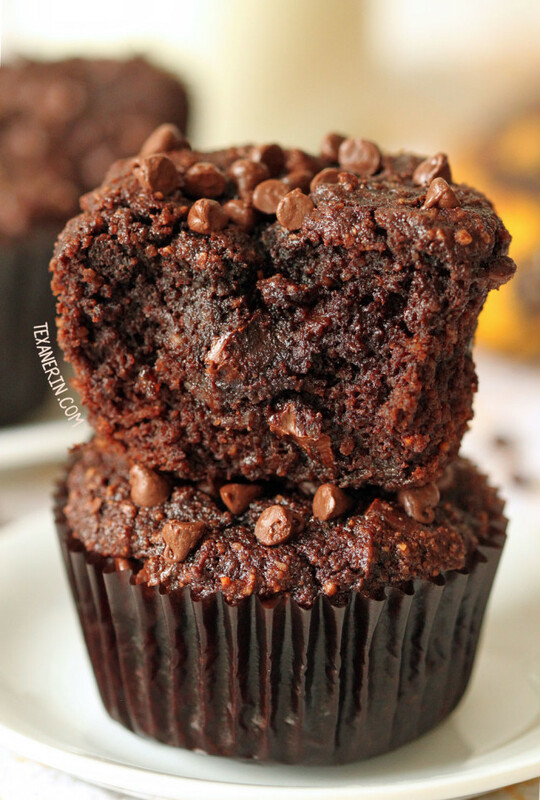 Tastes like a regular chocolate muffin. Cannot detect any carrot flavor. So delicious! Awesome! Then I’ve got to try it. :) Thanks for the tip and coming back and answering my question! Wow! These are wonderful. I substituted 1/2 C of GF oats for some of the almond flour to add more nutritional value. The whole family loves them. Thanks!! Oats sounds like a yummy addition! Thanks for the tip. :) I’m happy that they came out well with them and that you and your family enjoyed the muffins! I weighed everything and these came out wonderful. My toddler loved them. I’m going to try pumpkin purée next batch, so I can get extra veggies into the kids. Do you think this would come out well in a cake pan? The pumpkin puree worked and is delicious, but I had to change the following: I used a can of organic pure pumpkin which is 425grams. I didn’t want to waste any of it, so I used the entire can and omitted the eggs. Before going paleo, I used to add a can of pumpkin to chocolate cake mix to make muffins, so I was trying to replicate that. Also, I had to cook at 375. So yeah! Now there is an egg free option as well! So happy you liked them! They’re supposed to be fudgy but not really very gooey. Perhaps bake them 2-3 more minutes next time? And measure by weight if you didn’t the last time. Thanks for your comment! These were so good! By far one of the best ones yet. Need to see what other recipes you have.